Thanks for your interest in Ubuntu OpenStack. Canonical has sunsetted OpenStack Autopilot and replaced it with conjure-up. 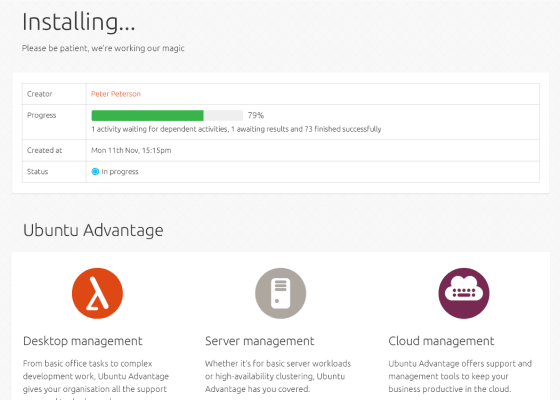 We welcome you to visit our OpenStack product page to find an Ubuntu OpenStack solution that meets your needs. OpenStack is the leading open cloud platform, and Ubuntu is the world’s most popular operating system for OpenStack. 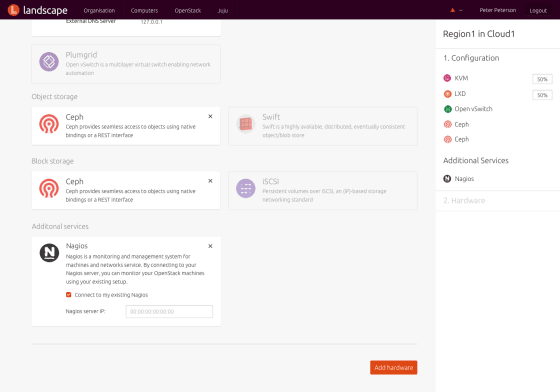 Over the past two years we have created a tool that allows users to build an Ubuntu OpenStack cloud on their own hardware in a few simple steps: Autopilot. 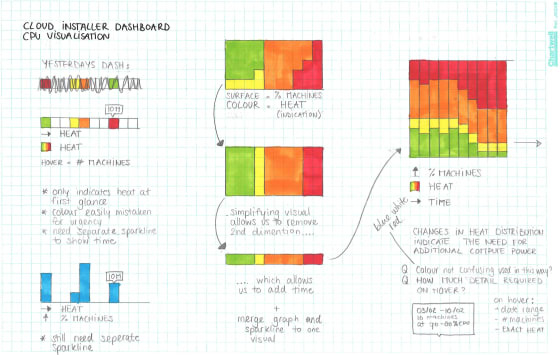 This post covers the design process we followed on our journey from alpha to beta to release. After the initial design phase Autopilot was developed and released as an alpha and a beta. This means that for over a year, there was a product to play around with, test and improve before it was made generally available. Almost immediately after the engineering team started building our new designs, we discovered that we needed to display an additional set of data on the storage graphs. On top of that, some guerilla testing sessions with Canonical engineers brought to light that the CPU and the storage graphs were easily misinterpreted. After some more competitive research and exploratory sketching, we decided to merge the graphs for each section by putting the utilisation on a vertical axis and the time on the horizontal axis. This seemed to improve the experience for our engineers, but we also wanted to validate with users in usability testing, so we tested the designs with eight participants that were potential Autopilot users. From this testing we learned to include more information on the axes and to include detailed information on hover. Before a user gets to the Autopilot wizard, they have to configure their hardware, install an application called MAAS to register machines and install Landscape to get access to Autopilot. A third tool called Juju is installed to help Autopilot behind the scenes. All these bits of software work together to allow users to build their clouds; however, they are all developed as stand-alone products by different teams. 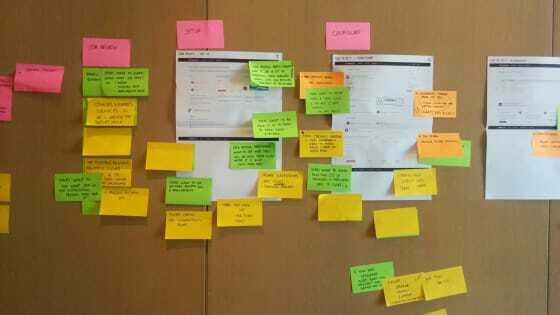 This means that during the initial design phase, it was a challenge to map out the entire journey and get a good idea of how the different components work together. Only when the Autopilot beta was released, was it finally possible for us to find some hardware and go through the entire journey ourselves, step by step. This really helped us to identify common roadblocks and points in the journey where more documentation or in-app explanation was required. Following our walk-through, we identified a number of points in the Autopilot journey where contextual help was required. In collaboration with the engineering team we gathered definitions of technical concepts, technical requirement, and system restrictions. Based on this info, we made adjustments to the UI. We designed a landing page with a checklist and introduction copy, and we added headings, help text, and tooltips to the installation and dashboard page. 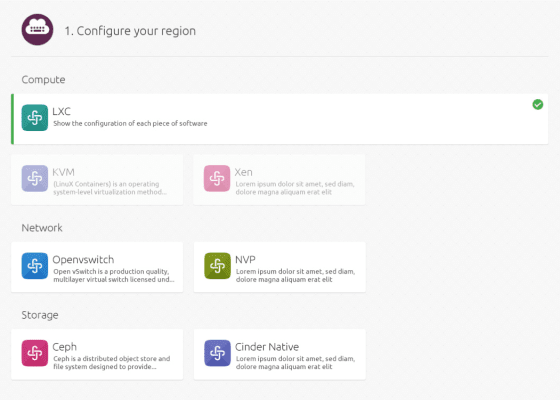 We also included a summary panel on the configuration page, to guide users through the journey and provide instant feedback. Perhaps the most rewarding type of feedback we gathered from the beta release — our early customers liked Autopilot but wanted more features. From the first designs Autopilot has aimed to help users quickly set up a test cloud. But to use Autopilot to build a production cloud, additional features were required. One of the biggest improvements for GA release was making it easy to try Autopilot, even for people that don’t have enough spare hardware to build a cloud. Our solution: try Autopilot using VMware! 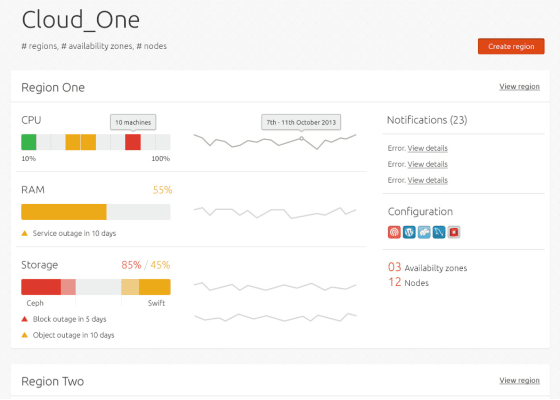 In the alpha version a user could already select nodes, but in most enterprises users want more flexibility. Often there are different types of hardware for different roles in the cloud, so users don’t always want to automatically distribute all the OpenStack services over all the machines. We designed the ability to choose specific roles like storage or compute for machines, to allow users to make the most of their hardware. 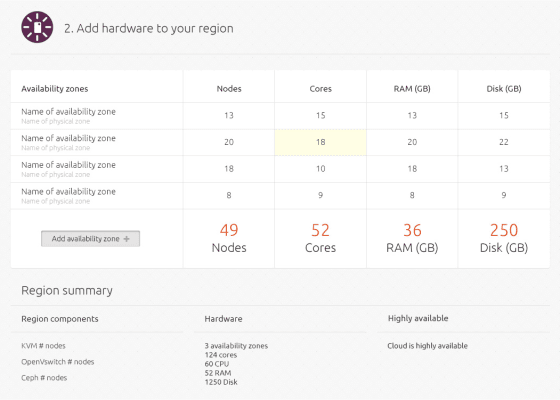 The first feature we added was the ability to add hardware to the cloud. This makes it possible to grow a small test cloud into a production sized solution. We also added the ability to integrate the cloud with Nagios, a common monitoring tool. This means if something happens on any of the cloud hardware, users would receive a notification through their existing monitoring system. This month we are celebrating another release of OpenStack Autopilot. In the two years since we started designing Autopilot, we have been able to add many improvements and it has been a great experience for us as designers to contribute to a maturing product. We will continue to iterate and refine the features that are launched and we’re currently mapping the roadmap for the months ahead. Our goal remains for Autopilot to be a tool for users to maintain and upgrade an enterprise grade cloud that can be at the core of their operations.